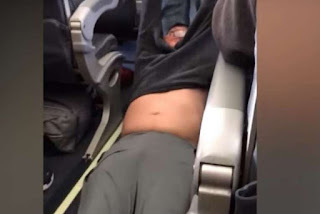 CHICAGO (AFP) - The chief executive of embattled United Airlines unequivocally apologised on Tuesday (April 11) for an incident in which a passenger was dragged off a plane, and promised a thorough review of the airline's practices. The apology came after a torrent of criticism around the world of the carrier's action on a flight on Sunday and its initial explanation of it. The family of the passenger, 69-year-old Vietnamese-American doctor David Dao, said they are appreciative of the public concern and support,and are focusing on his medical treatment in a Chicago hospital before making any public statement. "The family of Dr Dao wants the world to know that they are very appreciative of the outpouring of prayers, concern and support they have received," Mr Stephen Golan, one of the attorneys representing the family, said in a statement late on Tuesday, adding that the family has asked for privacy. In images now seen around the world, Mr Dao was forcefully removed and bloodied in the process – the entire event captured on video by passengers and posted on social media. He had refused to be "bumped" from the overbooked flight – an airline practice that has come under increased scrutiny since the incident. "I continue to be disturbed by what happened on this flight and I deeply apologise to the customer forcibly removed and to all the customers aboard," CEO Oscar Munoz said. "I want you to know that we take full responsibility and we will work to make it right." The comments were in stark contrast to the company's initial response, in which it seemed to at least partially blame the passenger, inflaming worldwide outrage. US media published an e-mail Munoz sent earlier to employees, in which he said the passenger "defied" authorities and "compounded" the incident. "Our employees followed established procedures for dealing with situations like this," the CEO wrote. Mr Andy Holdsworth, a crisis management specialist at the British PR firm Bell Pottinger, said United's initial response focused on the wrong thing. "Whilst the passenger's behaviour was not good, United have shown no compassion or concern for the man," he said. Mr Munoz said on Tuesday that the company will conduct a "thorough review" of its procedures, including "how we handle oversold situations" and how the airline partners with airport authorities and law enforcement. He promised to release the results of the review by April 30. But the public relations damage was done, with calls for boycotts and the US Department of Transportation promising a review of the airline's actions. Even the White House weighed in. "Clearly, when you watch the video, it is troubling to see how that was handled," White House press secretary Sean Spicer said. The social media outrage continued, with many users promoted hashtags #NewUnitedAirlinesMotto and #BoycottUnitedAirlines. The furor battered United's stock on Tuesday, sending it down 2.9 per cent in afternoon trading and closing down 1.1 per cent. It was the second time in about two weeks that the airline found itself in the middle of a firestorm. In late March, two teenagers were prevented from boarding a flight in Denver because they were wearing leggings. The airline defended its action at the time by saying the girls were flying on passes that required them to abide by a dress code in return for free or discounted travel. "They will need to be careful that these small incidents all start to add up and only remind us of the last incident as well as the current one," Mr Holdsworth said. 'YOU DON"T REALLY HAVE ANY RIGHTS"
The passenger on the overbooked Sunday plane en route from Chicago to Louisville, Kentucky, was one of four people involuntarily bumped to make room for a United flight crew. The incident shone a light on the practice of overbooking and bumping passengers off flights, which airlines increasingly rely upon to avoid losing money on empty seats when some passengers do not show up for scheduled flights. If they were to stop overbooking, "the only way of trying to compensate for that over the long term would be to raise fares on everyone else", said industry analyst Robert Mann. Instead, airlines sell more tickets than there are seats on a plane, and are generally able to properly forecast demand to avoid major disruptions in getting passengers to their destinations, Mr Mann said. But they sometimes miscalculate and inadvertently book more passengers than a flight can handle. In those instances, airlines offer travel vouchers and cash compensation to entice passengers to voluntarily give up their seats for later flights. "If you're still in the terminal waiting to board, you can be told you can't board, even if you have a reservation," Mr Mann said. "And once you're on board, you are subject to being deplaned based on the order of the crew. So you don't really have any rights." Last year, 434,000 passengers volunteered to be bumped from flights, while another 40,000 were bumped involuntarily and compensated.